Nice rifle and scope Garrett. I had to do a fair amount of judicious sanding to get mine to close enough to be able to bolt it closed and there is no talk in any of the books on there being two types of grips either. It truly is a mystery. When I first got into the M3 stuff, I had a guy offer me a stock for the M3 rifle that the front part was specially formed to fit the grip. But I was told later on it was for the M1 and M2 nights scopes. The trigger assembly has me stumped. This is the correct mounting position for it, but it does not fit the pot belly stocks at all. I had to sand this stock down (don't worry, it was an Italian stock) to get this to fit, it's almost like these need to be mounted on the straight stocks, but I know that they were mounted on M2 carbines. Makes me think this foregrip was off an earlier model. You can see where the power cord for the scope comes out the left side, the one on the right side powers the IR illuminator. Nice collection. I have at least two variations of the front grips and I believe that one type would only fit on the M1 stock. The one with two sets of holes, like yours, fit on the M2 without modifying the stock. I have not looked at them in years but will try to drag them out. I know I had to change the holes the screws went to mount one of the scopes. I wondered it they were modified from the older scopes that mounted under the stock. Here is a pic. I'll get a better pic of the front switch. Hey Copdoc, would it be possible to get a closer pic of that battery pack? Now, that is a stock that would be worth having! Here is one, snapped quick pics of last two. I posted some pics of my rig long ago. If you search infrared they will prob come up. most excellent, thanks for posting those, I will put them in my information file. Nice to see a thread on IR/NV. I am on phone but could not find previous thread with search. If it is gone ill repost the pics. Good deal. Hopefully, we can get others to post their NV. Sorry I guess it was too many pics, Charlie can you help me out? The PVS-2 not working well was disconcerting, it should work much better than it did. Oscillators are not impossible to find, but pricey. This morning, I got to thinking and it dawned on me that it has to be the batteries. They were new out of the package and after testing them, they were still good. Looking at the battery pack, it became obvious that whomever made the battery pack did not rig it into series for 3v, but left it in parallel for 1.5v and thus the oscillator did not have enough power to sufficiently operate the intensifier. I got a different battery pack that I paid good money for and viola', tube works fine. So, I took more pictures last tonight through the tube as it normally works. Tonight is a no moon night with no cloud cover. All ambient light is from starlight and reflective city lighting. The picture is slightly out of focus because the camera has difficulty focusing on the back of the intensifier due to the darkness and no flash. This picture is the same farmhouse as in the previous pictures. You can see that the bright lighting is disturbant to the the tube, all the lines above the lights are image burns. If the light is bright enough or long enough, these burns can become permanent. This is a 50 yard picture with a small amount of ambient light that was coming from behind, the equivalent to a small flashlight at 50 yards. Here you can see the reticle pattern much better. I wish the prices listed on these were still good. I would consider re-working my tube to make it operational again. I don't suppose you have tried making yours work? I so badly want to find one of those bags! I have not turned it on since about 1980. One of the power supplys ran and put out 20KV. I made a resistance pot. It worked great but once in a light rain I got a 20KV shock. I believe one of the manuals says it is probably not going to kill the operator but may knock him unconscious. I might be slow but I can learn. I have an original resistance pot now but it seemed a few thou too big for tube. It might be from age or just a different manufacture. I might fire it up again one day if I get enough time. Hey, since you have looked through one, what type of reticle does it have? Ya, a 20KV jolt would definitely get your attention, that is about the upper end of a carpet initiated elecrostatic shock, but I'm guessing there is just a tad more amperage. Excellent pictures. Here are the couple missing though. I would like to know a little more about these. The M14 had a setup that looked much like the old M3/T3 carbine setup. I think this was the AN/PAS-4? The AN/PVS-5, AN/PVS-6, AN/PVS-7, AN-PVS-9 series was goggles only. They were not for mounting on the weapons. Some were for aviators. 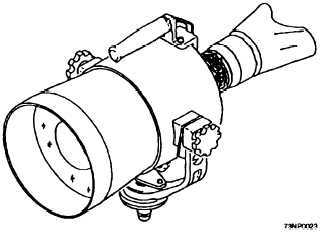 The AN/PVS-8 was a MASSIVE shipboard rail mounted night searchlight! These were HUGE. Edited by BigMoose, 07 January 2013 - 09:27 AM. Really appreciate the amount of time and effort that you spent on putting together this most interesting/informative thread! Also, the same, for the additional input from our other members. The history of NV equipment has always intrigued me. The AN/PAS-4 was an upgrade to the KW Sniperscope. The biggest difference is that it now had a mounted battery compartment so that you didn't have to have a backpack to carry the battery. It was still a active system and fell out of favor quickly in Vietnam since the Soviet made SVD and PSO-1 scope had a IR detector built into it. This feature caused the rapid push to passive scopes. 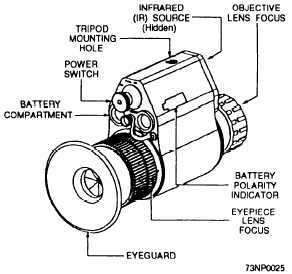 As for the PVS-10, it allows the user to be either a day or night scope by flipping a lever on the side. This allowed different prisms to turn and run the image through an intensifier, or directly to the shooter. From what I understand is that they weren't overly reliable, then the PVS-19 came out and this is where the lineage goes crazy with the PVS-22 that clips on in front of a standard scope to make it a NVG rifle sight. This is about where I loose track as there are a large batch of different sights and scopes, to many to keep track of. The biggest issue with rifle scopes and night vision is that the intensifiers are now so small and compact that the recoil of the weapon firing causes the MCP and the photocathode to collide and damage the tube, leaving black spots. Because of this, rifle scopes typically have lower grade image intensifiers than say aviator night vision goggle. This is where halo size comes into play, meaning when looking at a bright light, how large is the halo around the light , thus reducing what you can see. This is whole nuther topic. As near as I remember is just has a bright green dot. You can adjust the brightness with one of the controls. The small bulb is the light for the reticle on the front fixture. It has a pin hole aperture on the to limit light. I have not thought seriously about a restoring an M3 in years. I am going to pull it out and blow the dust off. Maybe fit the resistance pot, replace coax and see if one of the power supplys will run, but I will have to wait until after the flu season and a few more touches to the flamethrower. I agree with Don, this is a great thread and should be a sticky for reference. Thanks to other also. PS the 20k is more like a taser than a carpet shock. I have had all three. It is dangerous so be careful. Does your have the image tube? That is the critical part now. Did you know there is a bazooka mount for it and there is a yellow tipped spotter M1 carbine round to tag tanks? Edited by copdoc, 07 January 2013 - 03:13 PM.